Protecting Animal Rights:Agasthya, the tiger adopted by Indian cricket skipper M.S. Dhoni. Mysore: Indian cricket captain Mahendra Singh Dhoni has adopted nine-year-old tiger Agasthya at the Sri Chamarajendra Zoological Gardens (Mysore zoo) for one year from Wednesday, executive director of the zoo K.B. Markandaiah said. A communication to this effect was made by the former cricketer, Javagal Srinath, on behalf of Mr. Dhoni from Bangalore to the zoo authorities. Agasthya was zoo-bred, Mr. Markandaiah said adding Mr. Dhoni had given a cheque for Rs. 1 lakh for the adoption. With this, all the eight tigers in the zoo have been adopted. The list includes Karnataka Chief Minister B.S. Yeddyurappa and cricketer Zaheer Khan. Brahma, which was captured and brought from Kodagu, has been adopted for lifetime by yoga guru B.K.S. Iyengar. 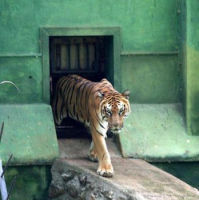 “Tiger, our national animal, needs protection. I'm adopting Agasthya to endorse and encourage our people to love animals and to stand for the cause of animal rights and conservation. Live and let live,” Mr. Dhoni has said.